I’ve only played roughly five minutes of it but I am in love with this game. You should all be playing it. Neverdaunt is a dream like world of floating Islands and falling stars where nearly anything can happen. 8Bit refers to the era of computers with eight bit processors. N8* parodies the graphics style these computers were capable of and 8Bit also refers to N8* being a kind of Neverdaunt lite. N8* is an online massively multiplayer virtual sandbox, A place to play, make friends, be creative and competitive. I’ll probably post more about it later just because I think it is awesome. For now let me just say that my player name is ThatOtherPerson so if you see me in game being my incompetent self then come over and say hi. 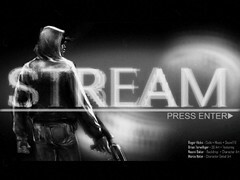 RekcahDam (who contributed the music for They Do Not Die and Dance Clone and perhaps more famously worked on Wings of Apocalypse and rComplex) recently released a new PC game titled Stream. But just remember that even once you complete the game you can never be too safe.